Judging by the 100 or so menus of the New York Wine and Food Society placed in the digital archive of the New York Public Library, few address English/U.K. cuisine. French menus abound, as well as many other European cuisines and not a few Asian or other foreign, and American, but very few in the British tradition. Hence, Julia Child wrote Mastering the art of French Cooking, not The Glories of United Kingdom Cookery. I’m not sure the situation is so different today but with the blurring of national and regional food traditions – with the menus of hip restaurants tending ever to resemble each other from Toronto to Turin – perhaps it’s a moot issue. 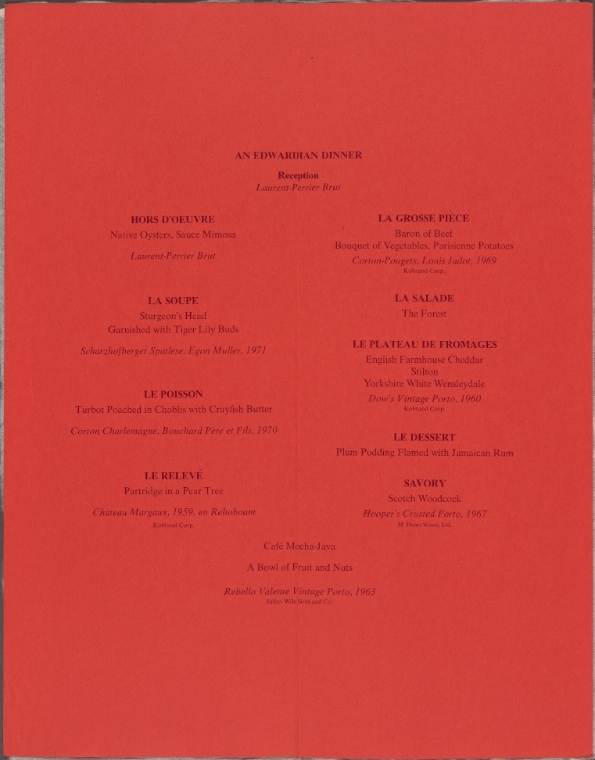 Nonetheless the NYPL’s archive of New York Wine and Food Society menus discloses exceptions. One area you find them is re-creating old English dinners. Presented that way, the food acquires new allure, helped by antiquated spelling of dishes from the The Forme of Cury or other venerable source drawn on, hallowed by tradition. Old is gold you know, or it was. Sometimes the history fetched up is more recent, and this was the case with an Edwardian meal offered by the New York Wine and Food Society in 1974. Punk rock is blazing and disco gearing up to entrance the masses. Alice Waters’ Chez Panisse in Berkeley is starting to make waves. A new restaurant in not-so-distant Ithaca, NY, the vegetarian-oriented Moosewood, will soon win awards for its innovation. On December 11, 1974 the Wine and Food Society was looking to pre-1914 culinary London for gastronomic inspiration. English classics like oysters, turbot, baron of beef, partridge (paired at least on paper with its inevitable pear tree), salad, old Cheddar, Stilton, and plum pudding were plated in this menu to emulate a dinner from King Edward VII’s day. That era, just ahead of WW I, was noted for extravagance in eating and menu choice. As another page of the 1974 dinner shows, for dinner parties of around 30 people literally hundreds of pieces of tableware and glasses were needed. These were handled by the many servants which grand houses, the upper middle classes, and the fashionable hotels could then afford. Parts of the above menu might feature at the great London hotels and restaurants such as Claridge’s, Savoy, Grosvenor, Simpson’s-in-the-Strand, Rules, and so forth. The wines no doubt also drew inspiration from the period evoked, with fine marques of Champagne, Burgundy, Bordeaux, and Port appearing. Staid perhaps, classics of the Bacchic tribe, and nothing to suggest regional alliance. But that’s how they did it then, and it was probably true to tradition. Actually, the Jamaican rum flourish for the pudding shows some native creativity. I’d guess one of the planners had run into the dish in the Islands and brought it to the salon of the Pierre Hotel which served the meal in New York. Brandy would have been more elegant, or at least, a mixture of brandy and rum. The use of kitchen French to describe some of the dishes was no doubt authentic as well, and reminded readers that the British menu presented was well, extra, luxe. We harp on beer here, so we are sorry we did not have the chance to consult to the 1974 committee for this dinner. Courage Imperial Russian Stout, then available in the U.S., would have been ideal to pair with the cheese. Or George Gale’s Prize Old Ale or a similar beer. Nothing like that was being made in America then. Anchor’s Old Foghorn barleywine came a year later, but beers might have been found to lend a dash of bibulous authenticity. This kind of meal looks super-old-fashioned today. Meat or fish-heavy, with just a salad for anything resembling a vegan “main”, it looks kind of dull. So the vanguard of food writers and restaurateurs found it when looking to contrast their bruited market and regional cuisines with the old school. Yet, neither form of eating was really better, or right. It’s how you look at it. 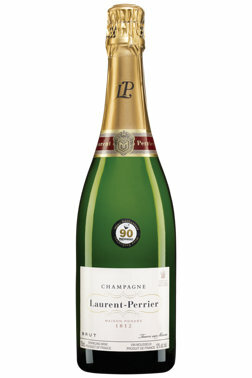 Meanwhile, pass the Laurent-Perrier. Note re images: The first three images above are drawn from the digitized NYPL menu linked in the text. The last image was sourced from the website of the Quebec Liquor Board, also linked in the text. All intellectual property in such images belongs solely to their lawful owner, as applicable. Images used for educational and historical purposes. All feedback welcomed. *I considered the validity of this position in this earlier post. But right or wrong, the proposition holds.